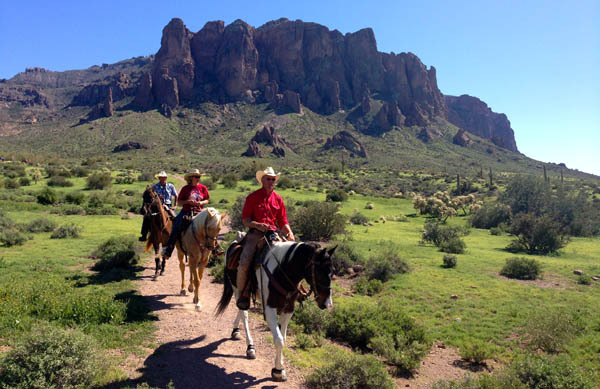 History of Goldfield- Situated atop a small hill between the Superstition Mountains and the Goldfield Mountains, the settlement of Goldfield got its start in 1892 when very rich, high grade gold ore was found in the area. A town soon sprang up and on October 7, 1893 it received its first official post office. 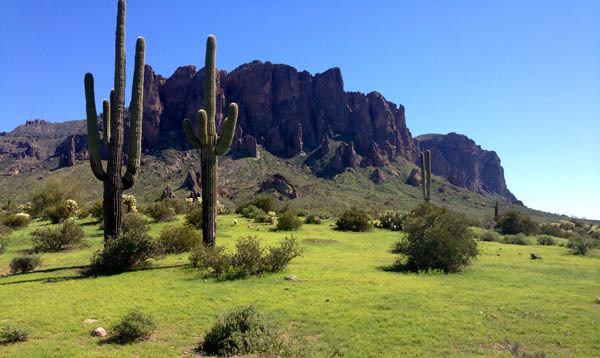 This “official” find, coupled with the legend of the Lost Dutchman Mine, which had been circulating for years, led plenty of new miners to the area and in no time, the town boasted three saloons, a boarding house, a general store, brewery, blacksmith shop, butcher shop, and a school. For five years the town boomed until some 1,500 souls were residing in the burgeoning city. But like other gold camps, Goldfield’s bustling days were quickly dashed when the vein of gold ore started to play out and the grade of the ore dropped even more. Just five years after it began, the town found itself quickly dying. The miners moved on, the post office was discontinued on November 2, 1898, and Goldfield became a ghost town. 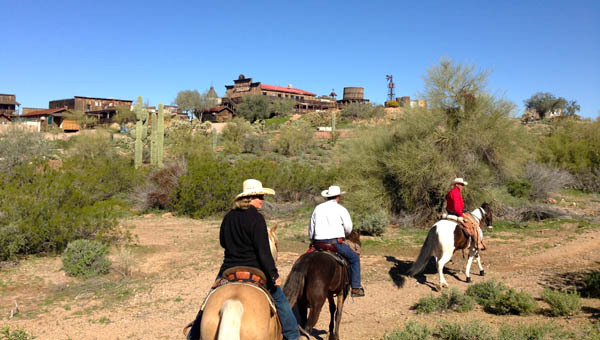 Goldfield is also were we camp with our horses. They have portable corrals and dry camping spots. There are also full hook-ups but you would have to book early for those. 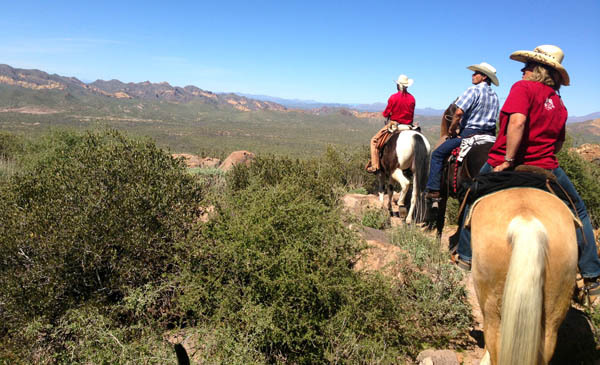 We headed past Goldfield with 2 new friends Greg and Dawn from Idaho. 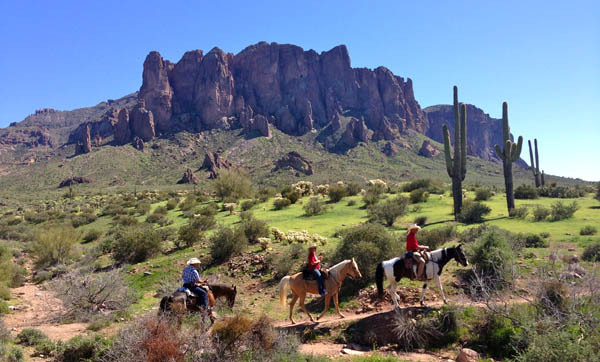 Our ride destination was the Massacre Grounds along side of the Superstition Mountains. The views get better the higher we go. The big cliff you see ahead in this picture is the one side of the Massacre Grounds. We are heading to the plateau above it. 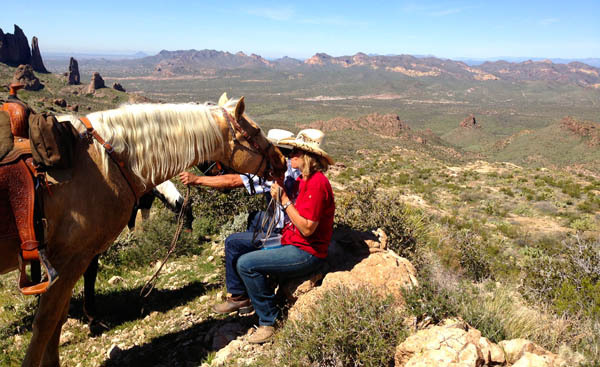 Dawn and Greg with their horses on the plateau of the Massacre Grounds. 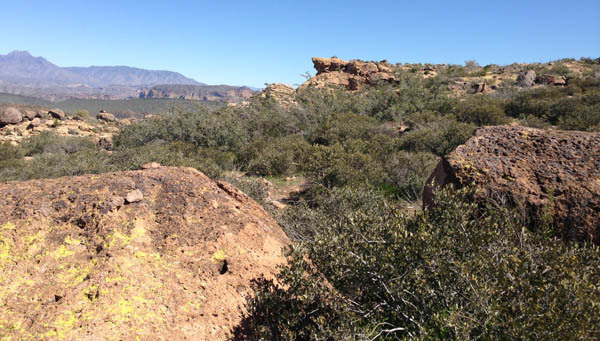 History on this site- The Massacre Grounds, where according to legend Apache warriors slaughtered a party of Mexican miners. 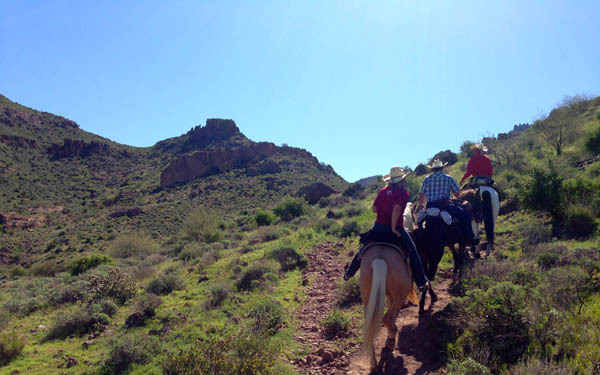 There are many variations, but the main story goes something like this: During the middle years of the 19th century, the wealthy Peralta family of Mexico operated several mines in what is now Arizona. In the aftermath of the Mexican War, with the new border shifting south, the Peraltas decided to extract as much ore as possible before their holdings became U.S. territory. 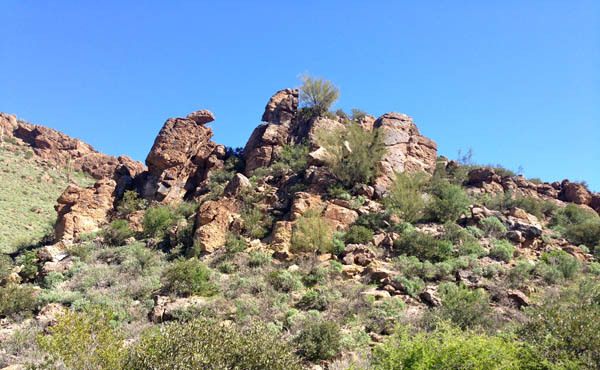 One last expedition, laden with rich gold ore, was on its way to Mexico when Apaches attacked, slaughtering the hapless miners on the northwestern flanks of the Superstitions. Years later, the single survivor of the attack revealed the location of the family's richest mine to Jacob Waltz, who had saved another family member from harm. 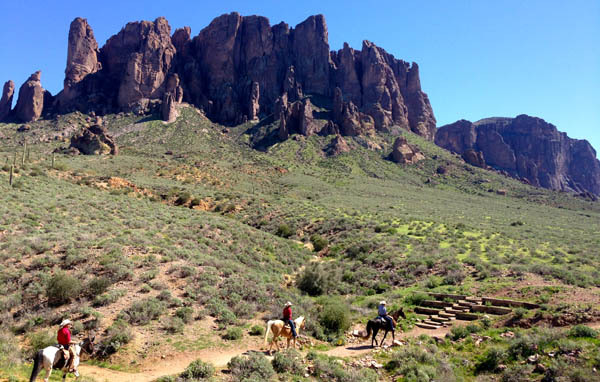 True or not, the account provides a foundation for tales of the Lost Dutchman Mine. Lending credence to the story is the report that in 1912 a couple of prospectors found gold ore worth $18,000 in the area where the massacre allegedly took place. 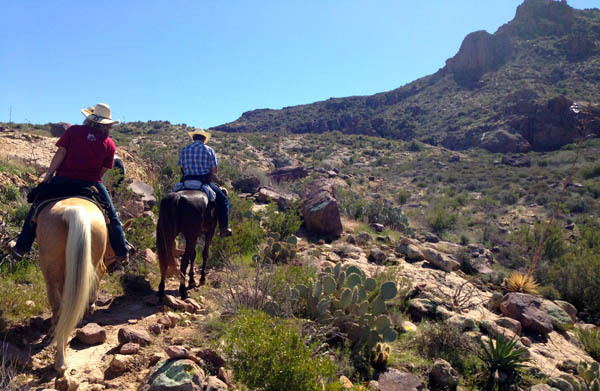 The first part of the trail to the Massacre Grounds is an old road that leads south from a small dirt parking area, climbing steadily into a magnificent desert landscape. 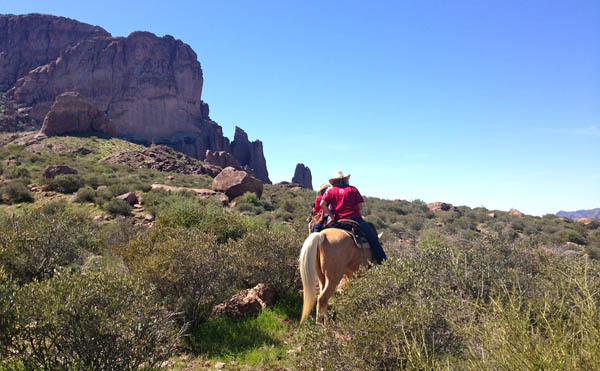 Before long, the route passes east of a hill topped by a distinctive rock spire. 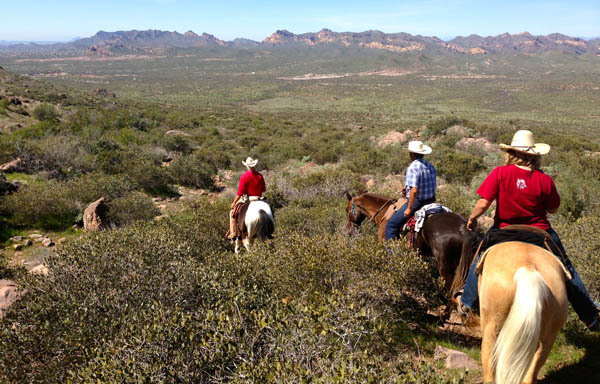 As you proceed, you gain terrific views of the Superstition ridgeline, the Goldfield Mountains and a foreshortened view of Four Peaks. 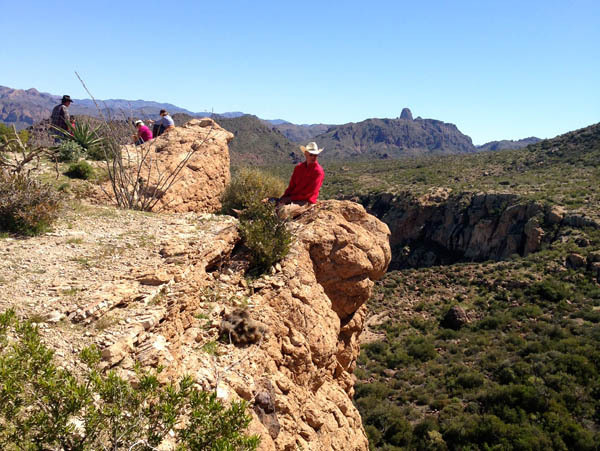 Soon you'll see the top of Weavers Needle in the southeast, peeking over a distant ridgeline. 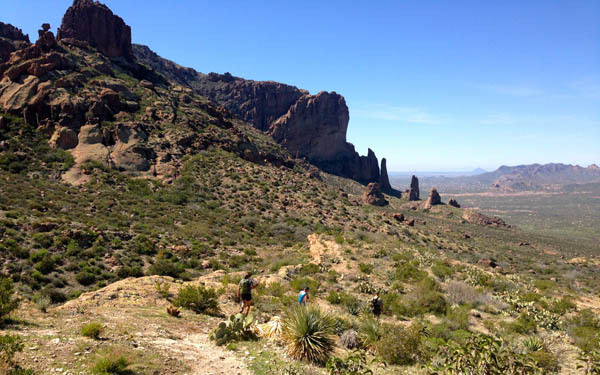 The trail is generally easy to follow, although it gains nearly a thousand feet of elevation and some sections are narrow, rocky and steep. 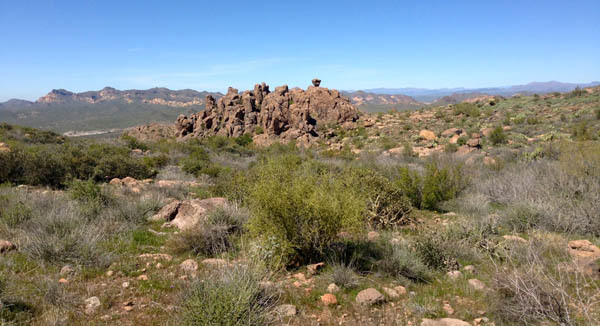 Several spur trails, many marked by rock cairns, branch out across the area as you proceed. 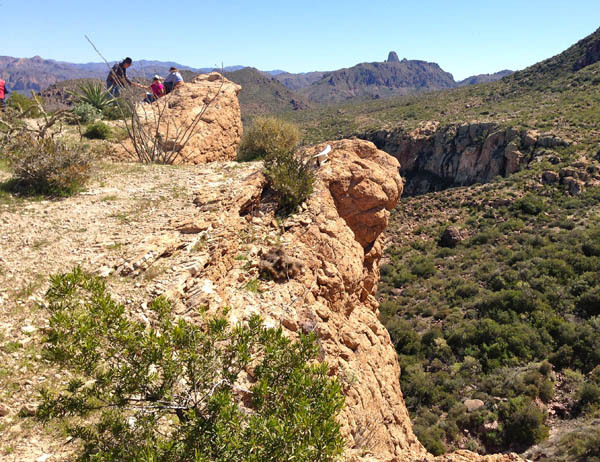 The main route goes around the west side of a substantial bluff then heads generally east, up and over a small ridge and along a long slope that ends atop a high cliff. 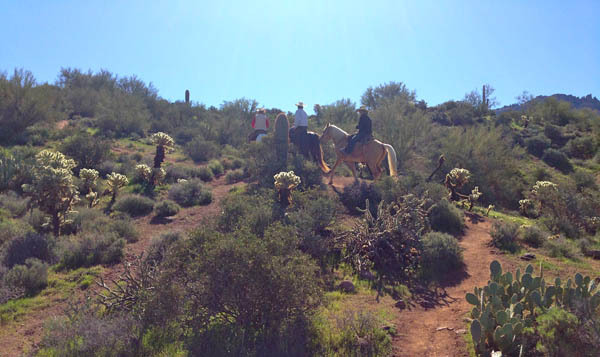 These trails are well used by both hikers and horsemen for all over North America. 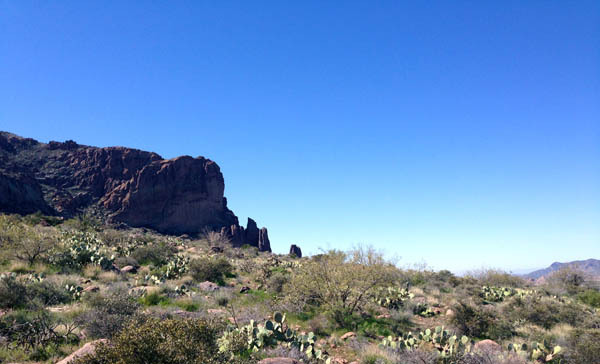 This year the desert is very green because of all the rain and even snow. There is so much beauty and history in this area. 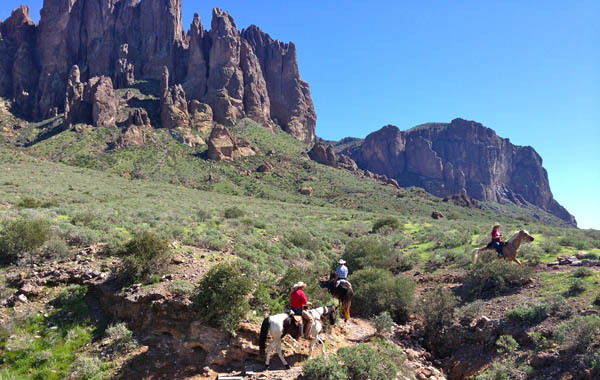 This is the Jacob Cross Trail that will take you all the way around the base of Superstition Mountain. 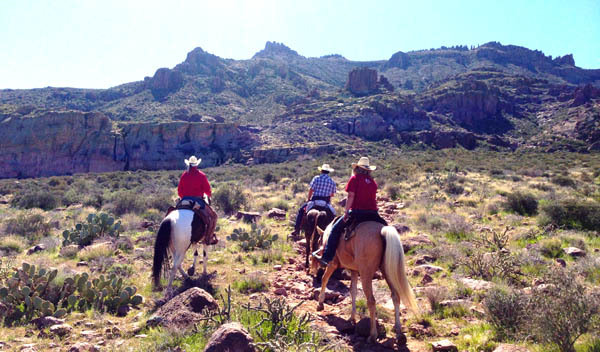 PLANNING A TRIP SOUTH THIS WINTER WITH YOUR HORSES? 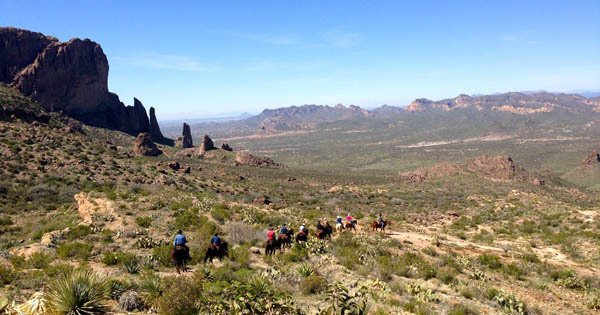 Chiricahua Monument ride "Best ride of my life"!! Kelly Allen of Canoa Farms. Simple theme. Theme images by andynwt. Powered by Blogger.